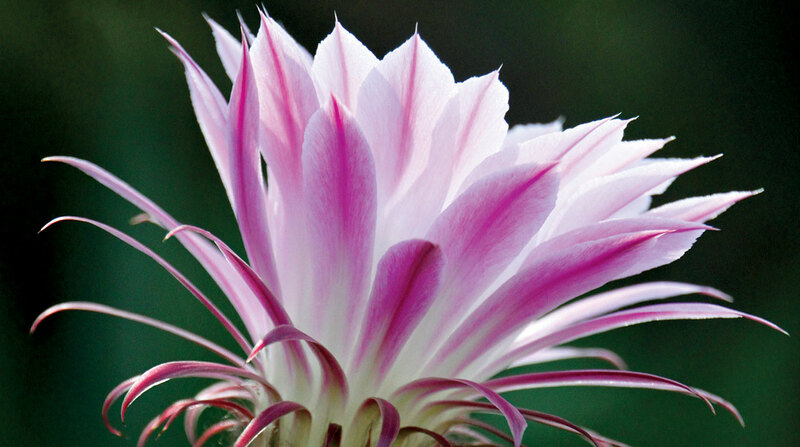 A pair of empty nesters find serenity in simplicity. For many homeowners, bigger is better, as evidenced by the current construction projects popping up across the Valley. But for Keith and Kimberly Meredith, a smaller home on a secluded 5-acre property was the right answer after they found themselves as empty nesters. The couple looked at more than 100 lots before finding an ideal location about 12 minutes due north of Cave Creek, in a saguaro canyon area known as Hidden Valley. 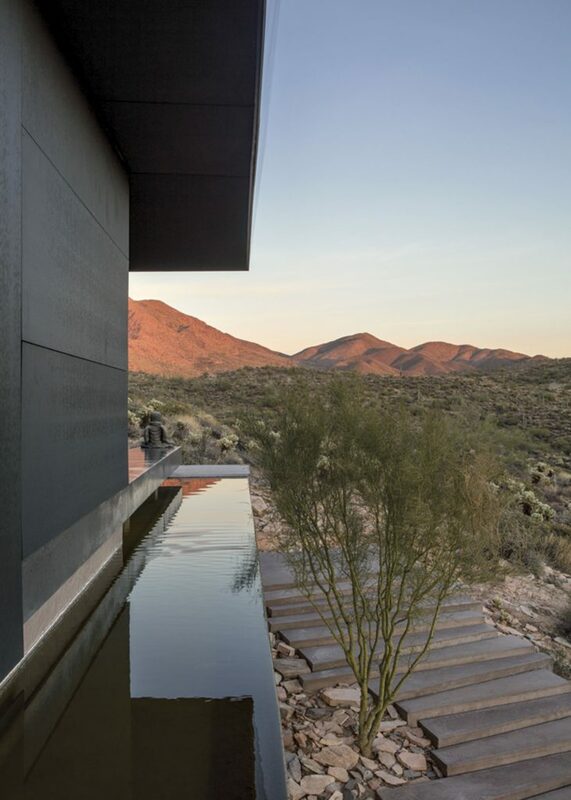 With a south-facing slope that looks toward the west side of Phoenix, with glimpses of far-away Pinnacle Peak and the McDowell and Continental mountains, an exposed flow of pinkish-red schist covering the ground and a cholla field that runs down the slope, the site had an almost magical pull. “It was the first lot that I fell in love with, and I kept circling back to it,” recalls Kimberly. 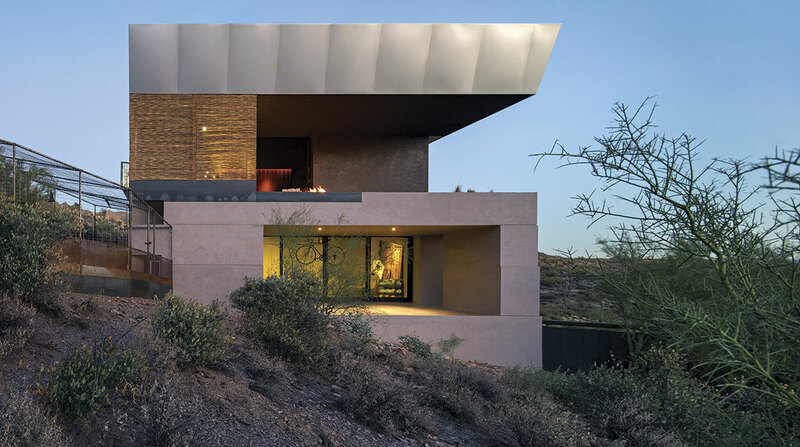 The couple knew that they wanted to build a custom, nonconventional home, and their massage therapist suggested they meet with prominent architect Wendell Burnette, who is known for designing contemporary structures with a keen sense of place. 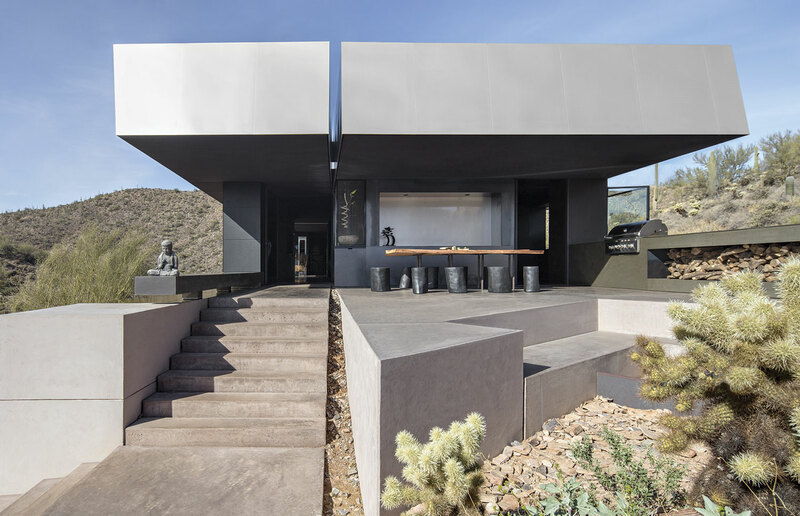 The architect also decided to incorporate the site’s most prominent feature—the pinkish schist field—and “extend” it into the design of the home. “The concept of the house is that this schist is flowing into a plinth, or podium, which is the base of the house. It’s a continuation of the geology,” he notes. 1. Shadows play off a steel plate guard rail along the southern edge of the house, creating a sundial effect. 2. Running alongside the southern edge of the entryway, a water wall provides a cooling vibe in the hot summer months. Topping the plinth is what the Burnette calls “a dispersed core”—think of it as a desert-friendly homage to Mies van der Rohe’s famed Farnsworth House. “Because of our extreme temperatures, we can’t do that much glass, so we needed to reduce the glass but we still wanted to capture all these pieces of the landscape,” he says. The house starts with a central core, and then pinwheels out to various rooms, each with its own view. On the east side of the building is the entrance, complete with a large patio with outdoor cooking, dining, fire pit and indoor-outdoor aviary. There’s the media/dining room that looks out to the north. An indoor porch with a fireplace, where the Merediths like to sit and enjoy a bottle of wine—opens to the south and the late afternoon sunset. The master suite is on the west end of the home. 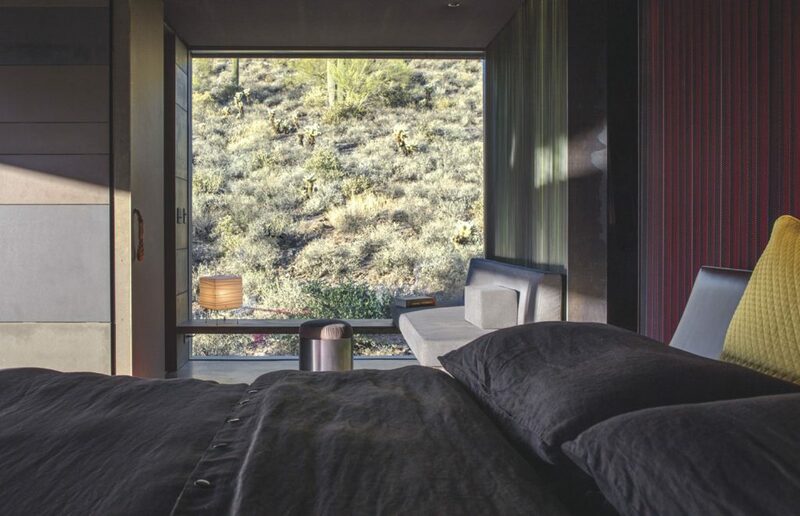 “It’s much more appropriate for the bedroom to face west because you get the reverse sunrise on the ridge,” says Burnette. “It’s a softer way to wake up.” Pocketing glass walls in almost every room allow the structure to be opened completely to natural breezes. 1.-2. Night or day, the entrance to the home is dramatic. The large covered patio features a grill, outdoor dining, firewood storage and a sunken fire pit. “We use the space every single day,” says homeowner Kimberly Meredith. To the right of the doorway is an indoor-outdoor aviary. 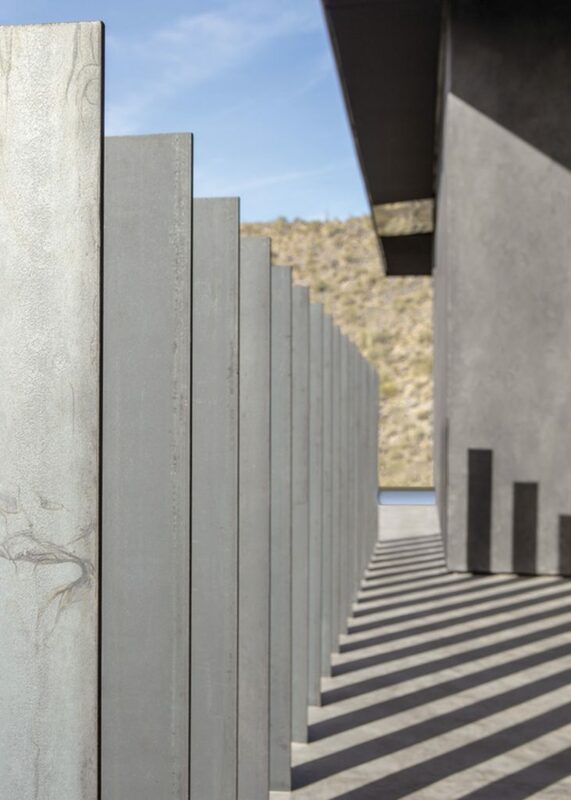 Echoing a split in the plinth alongside the stairway, the stainless steel fascia and canopy “cracks open as a way to signify entry,” says architect Wendell Burnette. 3. 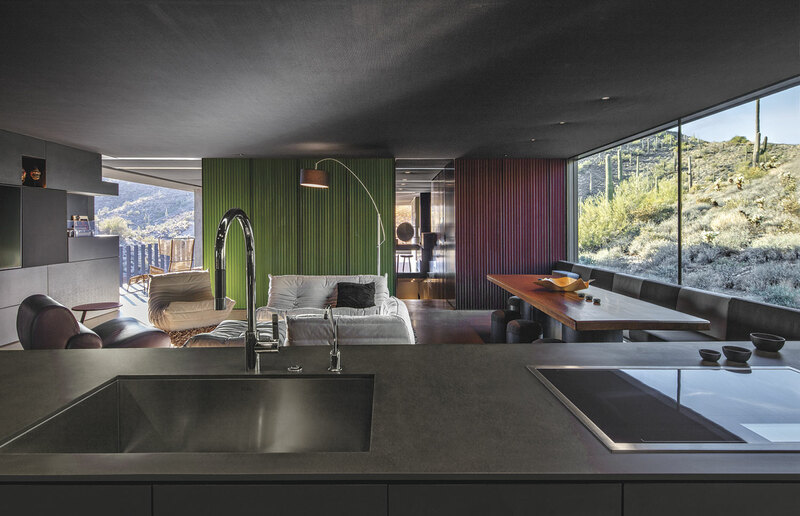 From the kitchen, the homeowners can see through house to the master bedroom and the landscape beyond. 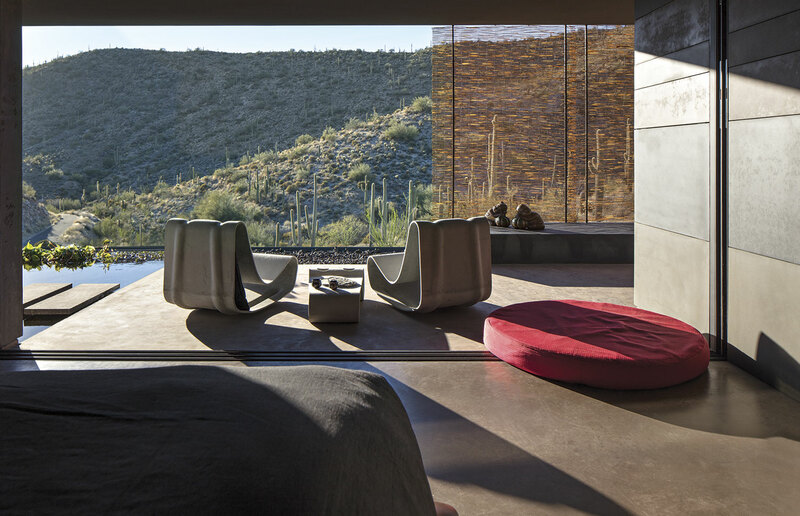 The palo verde green and deep red panels are made from corrugated, perforated mill-finished steel with colored acoustic felt behind them. Because the homeowners didn’t want to use all drywall on the interior, Burnette was able to play with finishes. He used a blend of steel cladding; wabi sabi stucco, which embraces the Japanese aesthetic of imperfection; and a resin-infused paper. 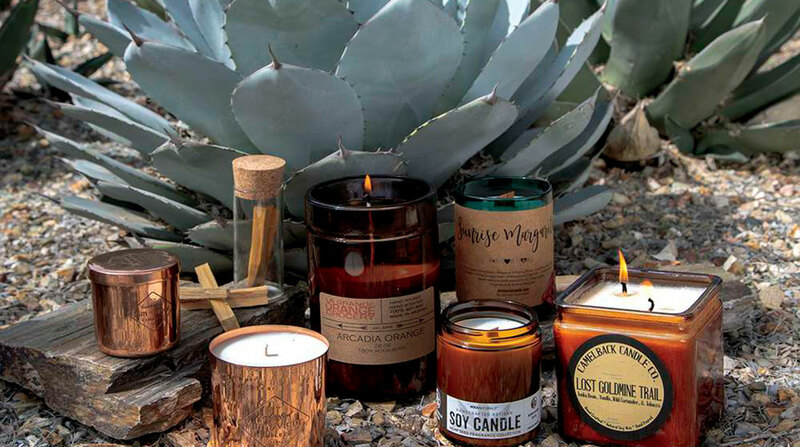 Together, these elements exude a level of richness in detail and handcraftsmanship not found in traditional homes. 1. A Buddha sculpture at the end of the water wall looks east toward the Continental Mountains. To the left is the aviary, which houses the Merediths’ two cockatiels and four parakeets. 2. Kimberly sits at the dining room table, which is located in front of a large north-facing window. 3. 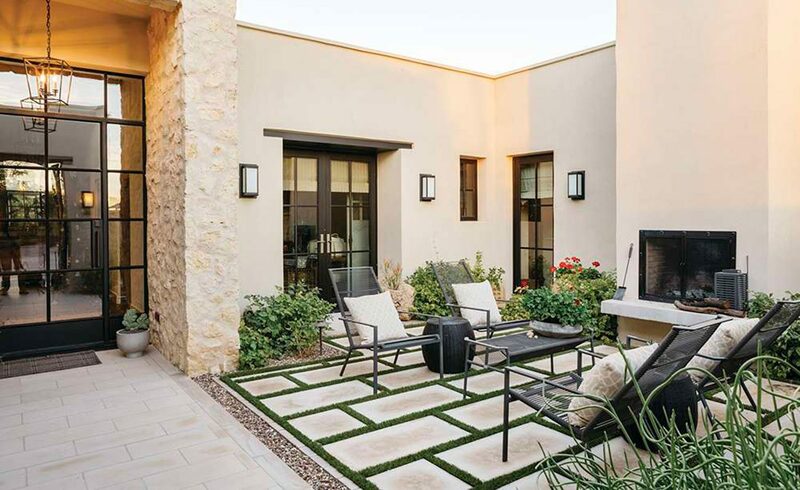 The master bedroom opens to an expansive patio that features a pair of ferro-cement chairs, a fire pit and a koi pond. The western ridge shades the house, while a low late-afternoon light filters in. The center of the home features a staircase that leads from the dispersed core into the plinth, which houses the garage and guest rooms. 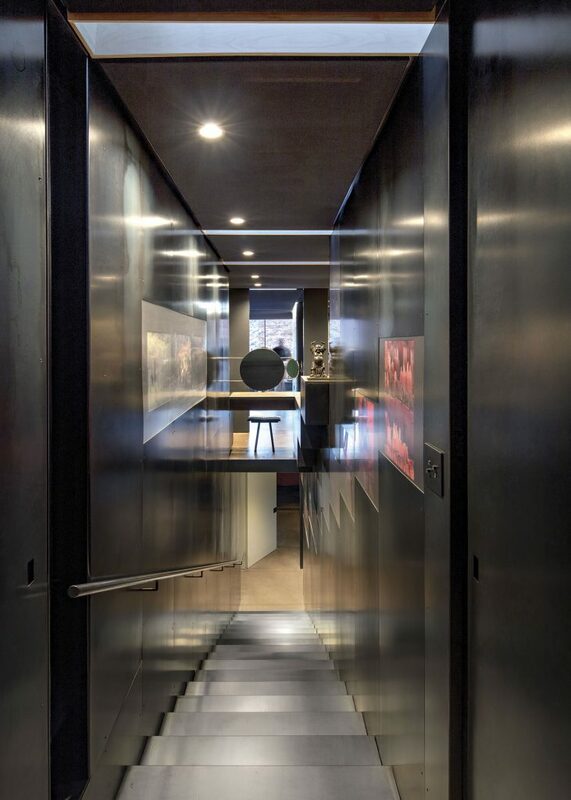 The walls are lined with mill-finished steel, which are inset with photographs set in antiglare glass. The stairs run beneath the master bath and dressing area, with views straight through to the western edge of the house. After deciding to downsize, the couple got rid of about 90 percent of their belongings, including clothing and furniture. One item they couldn’t part with, however, was the dining room table. “It’s an ironwood table that we bought in Argentina when we were living in Colorado,” says Kimberly. “It was the only item our children wanted us to keep because of all the rich family stories and things that have happened on it.” Burnette replaced its base and added custom steel-pipe, pin-cushion stools for a sleek, updated look. 1. A small lounge area in front of a north-facing window faces the doors to the soak/bathing room. 2. 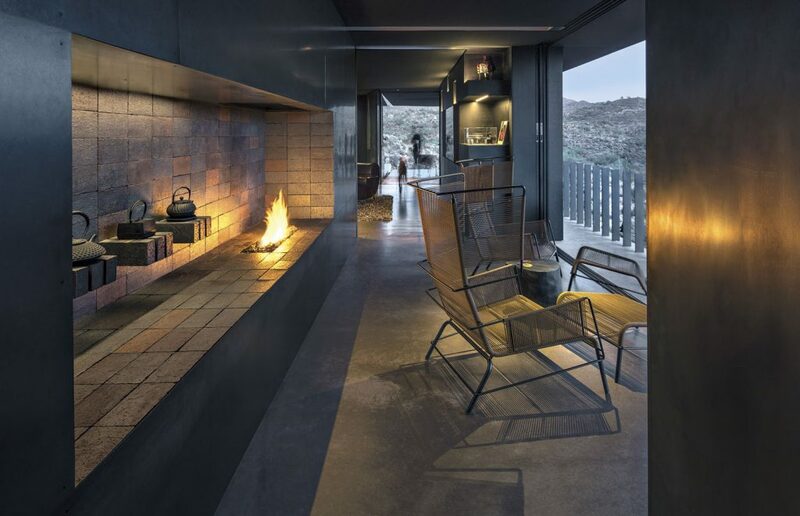 A view from the wine/fire room underscores the home’s connection to the outside. The large window wall in front of the fireplace pocket opens to create a indoor patio. Just beyond the sitting area is the entertainment center, which houses the homeowners’ TV and stereo equipment. At the far end is the front door, which leads to a large outdoor dining area. Small shelves in the fireplace hold a collection of antique teapots. The indoor-outdoor Throne Chairs feature a stretchy ropelike covering. 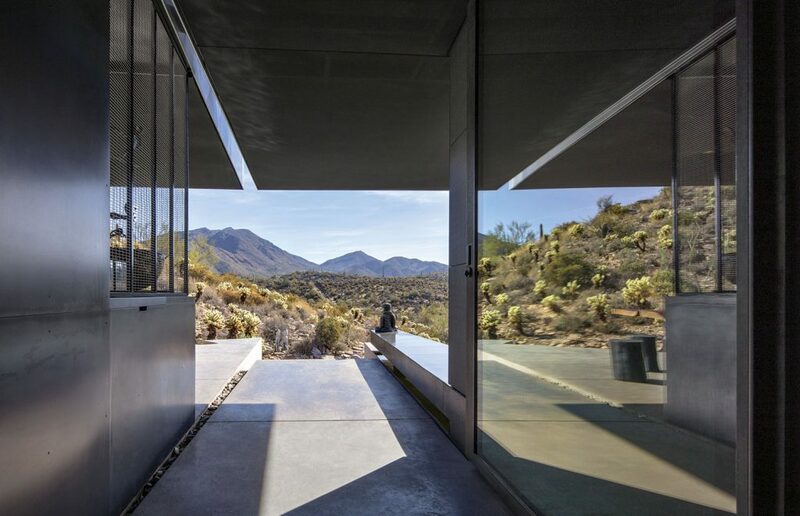 Surrounded by nothing but desert landscape, including the cholla field in the foreground, the home is designed to blend in with its natural surroundings. Of course, having a home that is open to the elements can be difficult with pets, especially when that home is located in an area replete with wildlife. “This was talked about a lot,” says Burnette. “Because the dispersed core is quite high off the ground, neither the dogs nor the cat is going to jump that far.” An enclosed dog run off the northeast corner of the plinth was designed to be rattlesnake-proof, and the front entry door has screens to keep the animals inside when no one is on the patio. 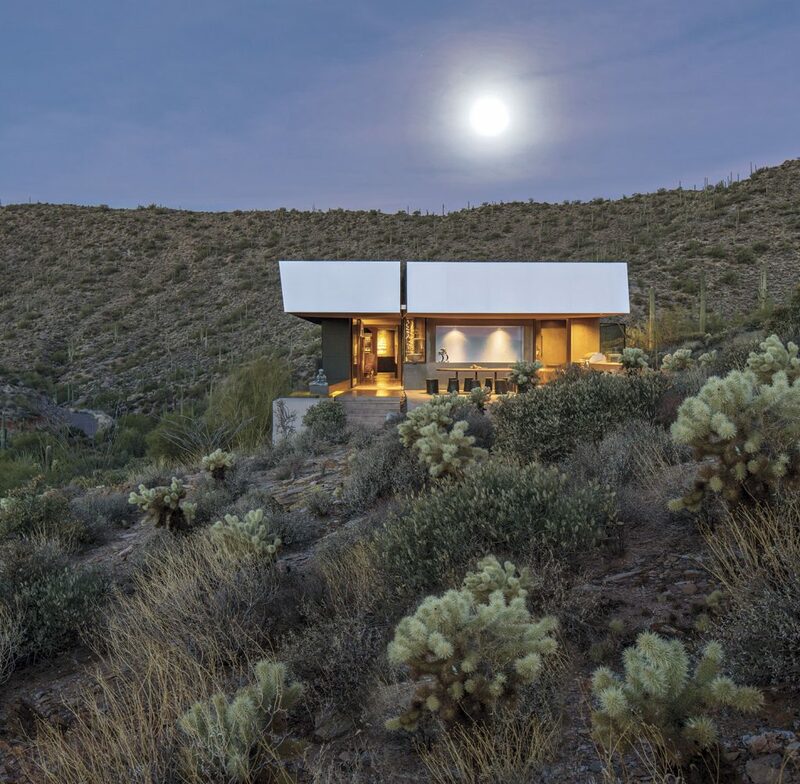 Topographic illustrations show the placement of the home on the saguaro-laden hill. The pink area highlights the changes in the earth’s color due to the schist field that runs through the property. 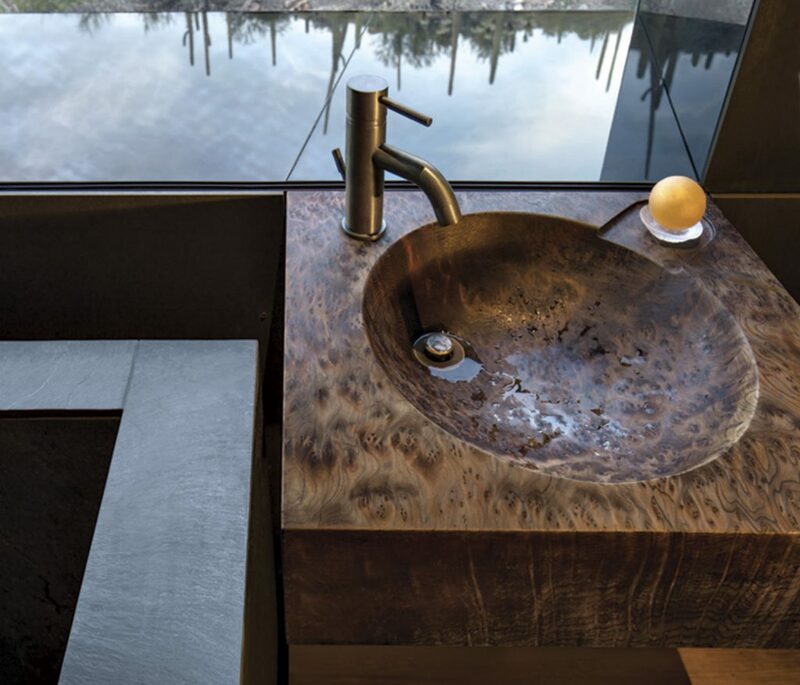 The bathing room features a Vermont black slate soaking tub and a handcrafted sink made from a rare birdseye redwood burl.